Yoga is all the rage now. Yoga is something everyone is willing to try for their physical fitness. Everyone is endorsing the benefits of practicing yoga and they have good reasons for it. Yoga is not only the physical workout, but it is actually designed for an all overall balance of a healthy body that is in sync with a healthy mind. Yoga is for everyone. It does not matter if you are a man or a woman. There are no different postures in yoga for men and yoga for women. Yoga can be practiced by both flexible and non-flexible people. There are many yoga asanas for non-flexible people. Yoga for non-flexible people is very helpful as these yoga asanas and postures for non-flexible people are very mild and gentle in nature and with time and practice, the flexibility of a non-flexible person will only increase, giving the body strength and bringing the mind come to a peaceful state. Yoga postures for non-flexible do not force or push your limits, and allows you to adapt to the limited flexibility that your body allows. Contrary to the popular belief that only flexible people can shine at yoga, the actual truth of practicing yoga is different. Yoga helps to develop your flexibility if you are a non-flexible as there are yoga asana for non-flexible people and it helps you to develop your body and mind in flexibility, stamina, and balance. When yoga is an unknown territory for you to step-in, it always helps for you to take baby steps towards it. 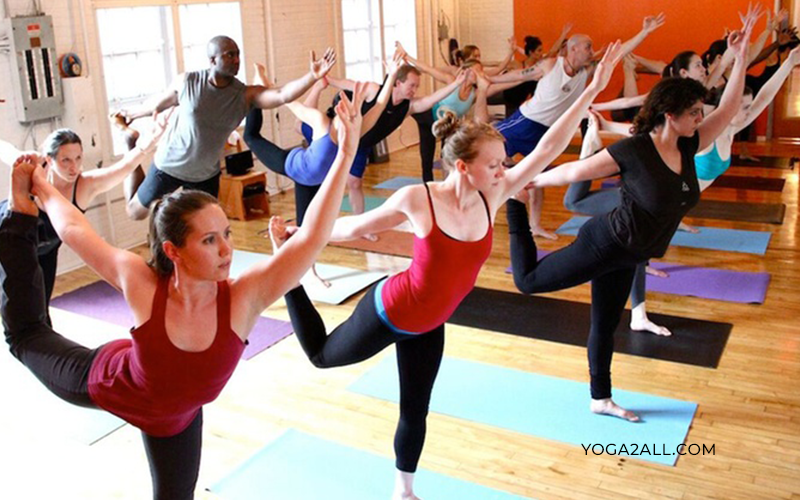 There is an array of yoga postures for non-flexible people to choose from that you want to do. No matter what yoga asana for non-flexible people you choose to practice, every asana is designed to improve your strength, flexibility, and balance. And not only that, it even helps to release tension from your body and mind, and eventually help you to relax and lead a healthy life. It is very important that you choose the right yoga postures and asana for non-flexible people that are at par with your current fitness level and will help you achieve your goals for practicing yoga, without stressing and straining your body. We shall look into a few yoga asana for non-flexible people that they can consider trying out. This will help in familiarising you with yoga asana for non-flexible people and be less intimidating when you start doing something you never thought you would do or could do. This is a great posture to kick off your yoga for non-flexible people routine. To begin this asana, go down on all your fours in a table-top position. Keep your hands aligned with your shoulders and your knees aligned with your hip-width apart. Make sure that you have good balance on all fours and place your head looking forward. Inhale deeply, arch your back and let your belly muscles sink down towards the floor. When you inhale open your chest wide to let the air flow in. lift your head and look up. Hold this pose. Exhale and go back to tabletop position. Repeat. To start doing this asana, go down on the floor on all your fours. Make your body align in the manner of a table, where your back is the table top and your hands and legs imitate the legs of a table. Keep your hands at shoulder level and legs parallel with your hip-width apart. Press your hand and feet to the ground. Now breath deep and exhale, while doing this push your hips up, by keeping your hands and legs straight and grounded on the floor. Your body should make an inverted V-shape. Hold the pose and inhale and exhale deeply. Relax and repeat. This is an extremely relaxing and beneficial yoga asana for the non-flexible people. You can do this yoga asana by using a long pillow or blanket, which will give support to your back and buttocks. Begin by sitting on your left side pressed against the wall and your lower back on the floor or your supporting prop, if you are using one. Now gently turn your body to the left and in one swift motion bring your legs up against the wall. You can also push your legs up the wall slowly and use your hands to shift your balance as required. Your lower back should align to the floor, while your head and shoulders should rest on the ground. Your body must form an L-shape. Relax your body and breathe deep. Hold the position for as much as you can. Exhale and slowly let your legs slide down your right side and complete the pose by bringing your body into a seated position. To begin this asana, lay on your stomach with your legs and forehead on the floor. Keep your legs close together with your ankles touching each other. Now place your hands on the floor and bring them closer to your torso. Balance your upper body on your arms and gently lift it up. Your navel should keep contact with the floor and put equal pressure on both your arms. Arch your back as further as you can and let your head tilt back. Breath deep and do not strain your body. Hold the position. Relax by exhaling and going back to the original pose. Repeat. An extremely beneficial yoga asana for the non-flexible as it works on all your major muscle groups. Lay on your stomach with your legs close together and arms alongside your body. Inhale deeply and lift your legs up, by clenching your thing and buttock muscles. Lift your arms in a reach out position keep your neck aligned with your spine. Put pressure on your pelvic bone and press it to the ground. Hold the pose and concentrate on your breathing. Exhale and relax your body by putting your chest down and then your legs. Repeat. This yoga asana can look a little intimidating for beginners. But with practice, it will get better and is a great yoga pose for the non-flexible people to build overall body flexibility. To begin, relax your body by lying down on your stomach. Keep your legs at hip width apart and your arms by the side of your body. Slowly reach your ankle with your hands by folding your knees up. Inhale deep and lift your chest to create a tension in your body. Do not over-stress your body and allow it go as far as possible while holding the pose. Look straight ahead. Hold the position as long as you can while concentrating on your breathing. Exhale and gently bring your hands and legs down to the floor. Repeat. The above-mentioned poses of yoga can absolutely help you to overcome your inflexible and rigid body. It must be remembered that yoga is beneficiary for everyone and practicing these yoga asanas for non-flexible people will help you to achieve an agile body and a sound mind. You must certainly remember to pursue practicing these yoga postures for non-flexible people and make sure that it suits your current fitness level and body conditions to help you achieve the body that you always dreamt of. Do it regularly, without straining your body, and you will see yourself transforming into a person you never believed could possibly perform yoga poses with such ease.